As the summer draws to a close, we find ourselves preparing for the winter months with some good old-fashioned home comforts. We know how difficult it can be to fit cooking a balanced meal into your busy schedule, but now you don’t have to slave over a hot stove any longer. A slow cooker is a great way to prepare your family favourites when you have very little time to spare. You can make tasty dishes while you relax in front of the telly by investing in a slow cooker that will take all the hassle out of cooking. Simply throw your ingredients in and let the pot work its magic. You can even put it on in the morning so that when you come home from work you’ll be greeted with the fantastic aroma of a home cooked meal ready to be served. Add to the mix a steamer to cook your accompanying veggies, and you really have a picture of ultimate ease. There are many factors to consider when investing in the right slow cooker for you. First of all, the type of dishes you wish to make will dictate the size and shape you choose. Oval shaped cookers prove the most popular for most dishes including meats, stews and curries. You can also get round shaped cookers which are better for saving space on your kitchen counter top but are an awkward shape to fit a whole chicken or joint of meat in. It is important to remember that the capacity on slow cookers should not be taken as gospel and may not be the same as their working capacity. You’ll need to consider the amount of people you’ll be cooking for to ensure no one goes hungry. The general guidelines recommend up to 3L for two people, up to 5L for 3-4 people and you can get slow cookers with a capacity of up to 6.5L for bigger families of 5 people or more. There are a range of other features to look out for that can help you prepare the best dishes. Slow cookers with pots that are hob-friendly allow you to brown off certain dishes before serving, and a clear glass lid will help you keep an eye on the progress of your dish. Heat distribution is important to know so that you invest in the best cooker for the recipes you’ll be making. Some larger pots don’t always distribute heat as well, so look for ones with heating elements on the bottom and sides for a more even cook. We love this versatile slow cooker that offers a wide range of features at a bargain price. This would be a great investment for a new home and for those looking to buy their first slow cooker. If you love a Sunday roast then this oval pot is the best slow cooker for preparing perfectly cooked meat, and it is hob-safe so you can prepare your meat and veg all together for a flavoursome meal. It also has a sleek design and comes in red which would look smart in any modern kitchen. Cooking a well-balanced meal for a big family everyday may seem daunting, but when you invest in the Crock Pot Family Slow Cooker you’ll be spoilt for choice when it comes to meal time. This is one of the best slow cookers for big families and it allows you to cook anything from meat and fish to rice, vegetables and even desserts! With 5 pre-set programmes, you can slow cook, roast, steam, sauté or bake for perfectly prepared meals the whole family are guaranteed to enjoy. Not only this, but it’s easy to clean meaning dinner time with the family can now be a hassle-free experience from start to finish. 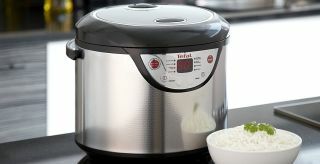 If you often find cooking for yourself a chore, then the Tefal 8-in-1 Multi Cooker is sure to change your mind. Forget microwave meals and say hello to a home cooked meal with minimal fuss. Although small, this slow cooker gives you a world of options with 8 different cooking settings and it comes with a recipe book so you’ll never be stuck for ideas again. You won’t have to worry about the stress of washing up when the non-stick pot is easily removable and low maintenance. This medium sized pot is the best slow cooker for rice dishes such as risotto and also has a number of functions that allow you to prepare tender and juicy meats that melt in the mouth. The cooker settings will keep your food warm for 5 hours before automatically switching off and it also comes equipped with a steam tray to make the perfect vegetables to accompany your dish. Some have said the instruction manual is tricky to understand, but once set up you’ll be able to use this multi-function cooker with ease and show off your celebrity chef skills to all of your friends and family. Despite being the smallest slow cooker on our list, the Lakeland Compact Slow Cooker is great for saving space if you have a small kitchen and is one of the best slow cookers for students due to its bargain price! You’ll be able to recreate your favourite home cooked meals that are bursting with flavour in just one pot. Its compact size means it can easily be stored in the cupboard and only brought out when needed, and is really easy to clean for minimal mess when cooking. This Russell Hobbs Chalkboard Slow Cooker is a great way to get the kids involved in meal prep for the family. It comes with a matt black powder coating and 2 pieces of chalk so that you can write or draw on the side. With its medium capacity, this is one of the best slow cookers for families of 3 or 4 and is compact enough to fit on your kitchen counter and on the dining table to serve. At £25.00 this is a bargain buy, however many customers have noted the sticker leaves a stubborn residue on the side of the pot. Enjoy reading this? Check our our guide to The Best Pressure Cookers.